Summary: Here is a special walk, part of the European Nave Nortrail (North Sea Trail) without needing a passport. 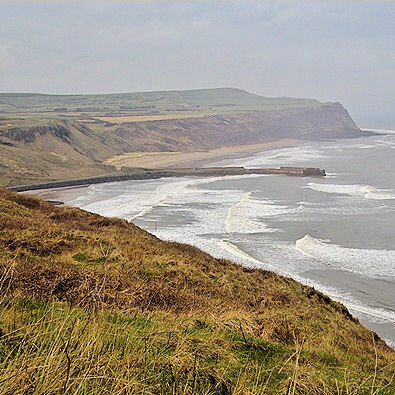 Grab this section of the Yorkshire coast and the Cleveland Way before it disappears into the sea. Some great scenery, quaint villages, bags of history and white horses on your right. The Walk: I was taking a short winter break at Staithes. 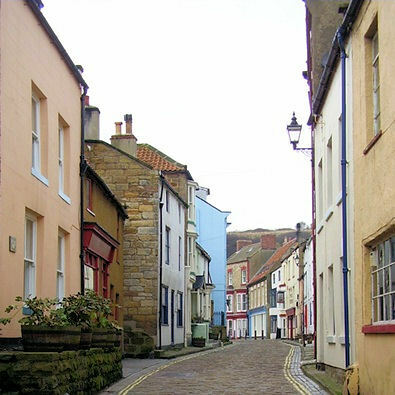 On our first visit some 20 years ago we fell in love with the village because it was not the holiday destination which Runswick Bay and Robin Hoods Bay had already become. Sadly tide and time waits for no sleepy community so as the waves role into the harbour so do the in-comers and by doing so they destroy the character they so admire. 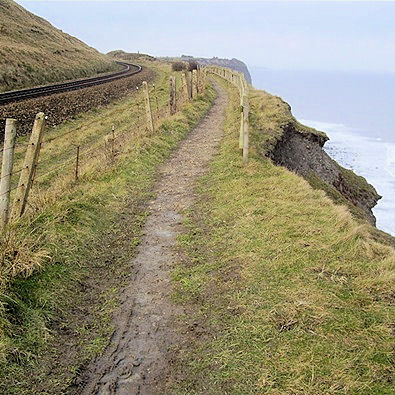 This walk of 11.6 miles starts at Runswick Bay and goes north along the Cleveland Way coastal path to Saltburn by the Sea. At the time of walking and writing there is a good bus service along the coast road which offers a convenient return for this linear walk. There were also a number of press bill boards warning of cuts to bus services so check the timetables before setting out. 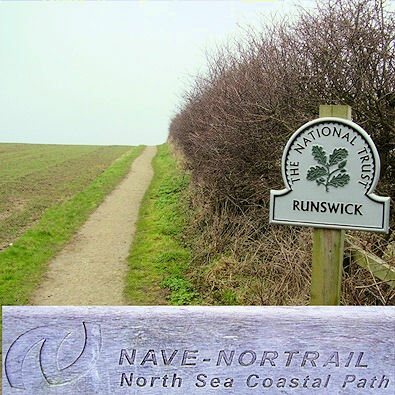 Besides being the Cleveland Way our path is part of Nave - Nortrail or North Sea Trail which extends to Holland and the Scandinavian countries. It would appear that despite Britain having a significant mileage of North Sea coastline the path only walks sections in Yorkshire, Northumberland and Scotland. It is well worth having a nosy around the old village of Runswick Bay before setting out but it's a good climb after exploring all the alleyways that offer the only access to many of the cottages sitting snug against the cliff with views across the bay. The sign makes clear our route is through the pub car park, not along the track just to the right of the hedge. The field edge path is well surfaced and soon leads us to the cliff top. It surprised me how much shipping there is along this coast, there was always at least one vessel in sight and at night they were still there, lights blazing. This coast is very different from Pembroke or the South West where the sea can crash as much as it likes on those hard immovable granite cliffs. The cliffs here look so fragile, layers of soft clay but close inspection reveals that the cliff is not as soft as it appears providing limited longevity to natures art form. Nevertheless the sea is slowly making an impression as we will often see on our journey. Port Mulgrave soon comes into view and I recall the old pictures on the wall of the Ship Inn when it was a real pub and not the present day 'Licensed Tea Room', it might be worth a visit if you are passing at the weekend, but its not open today. A pier below was once busy loading ships with ironstone first mined locally then brought by tunnel from Grinkle Park Mine. Moving on to Staithes we drop into the old fishing village down Church Street to the harbour. Rather than keeping to the narrow roads try exploring the numerous paths between the cottages as these offer excellent views over the rooftops. At night they are easy to identify because they have street lamps but during daylight if there is no gate to bar your way then it most likely is a public path. How householders know where their boundaries are is a mystery, a nightmare for conveyancing solicitors and Land Registry I suspect. While one council department tries and appears to succeed in removing cars from the lanes another provides each house with two wheelie bins to defile the street scene. Thank goodness for digital photography and the wonders of an airbrush. 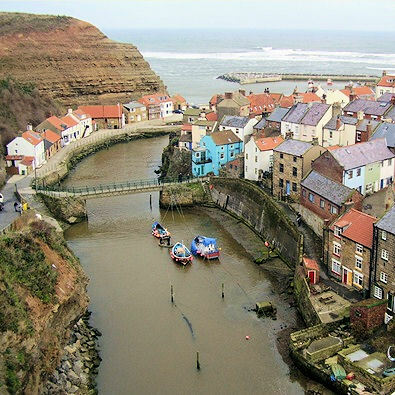 Crossing the bridge we leave Staithes and enter Cowbar, we also leave North Yorkshire and enter Redcar and Cleveland, formally a part of the North Riding they still proclaim. A detour, if you wish, onto Cowbar Nab offers another stunning view of Staithes then off again along the coast. Take care on the old road which has partly disappeared into the sea and wonder at the cross in 'Loving Memory of Shirley Parker' so close to the cliff edge. 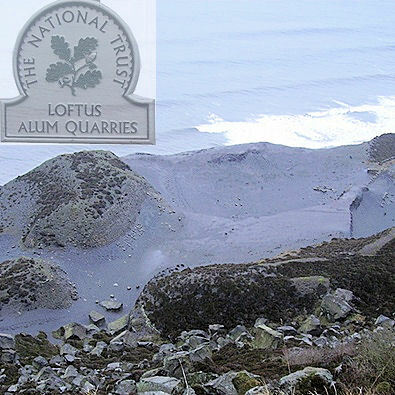 The Boulby Pot Ash mine, at over 1400 metres, is one of the deepest mines in Europe and the buildings above ground dominates our inland view but there is so much to see along the coast so it gets only an occasional glance. There are a number of interpretative boards to answer my questions along this walk but I found it surprising that a significant location on the whole of the English east coast was not marked on the ground. 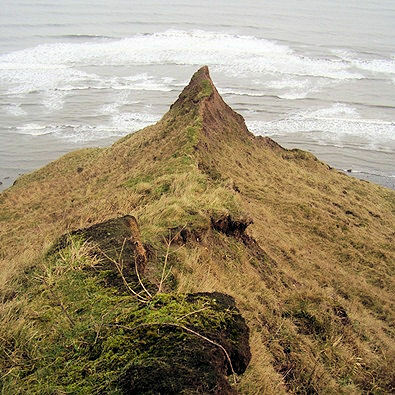 Boulby Cliff at 203m is the highest point on the east coast of England so pause a while. Not a stunning vertical drop to the North Sea but a worthy location, and that's not all. Below us on a step in the cliff there are remains of stone retaining banks which look like harbour walls without water. A board explains that the Alum industry began along this coast around 1600. The production sounds smelly with urine being imported from as far away as London, yuck! I don't think this would be a nice place to visit back then. 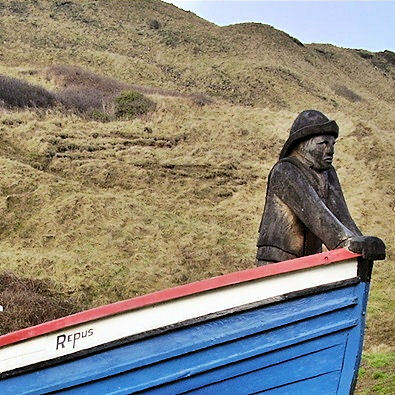 Our next destination is Skinningrove a settlement that is as yet untouched by gentrification. The houses cluster in the valley and the Tata steelworks on the high ground still makes special profiles, whatever they may be. 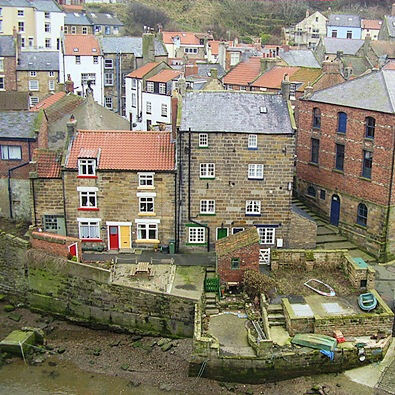 In between, the allotments and pigeon lofts which here looked more cared for than those now abandoned and derelict in Staithes. 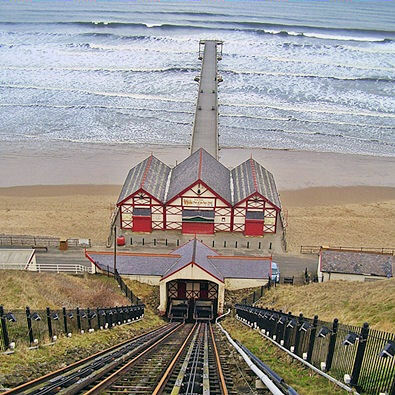 I made a mistake on the exit and climbed the old incline when I should have stayed, for a while, on the beach. The routes soon converge before I approached the highlight of the walk around Warsett Hill. I had recently seen this spectacular section of railway line on the TV and hoped that I would see a train pass along the line as I walked along the path. 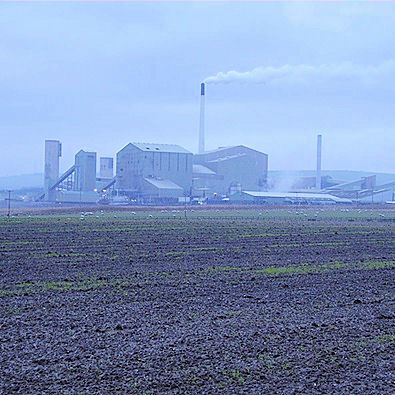 I had heard a distinctive horn in the distance and looked expectantly but in vain along the line towards the potash mine. I was intrigued by the building opposite but have now discovered it was a fan house to ventilate the Huntcliff Ironstone Mine. 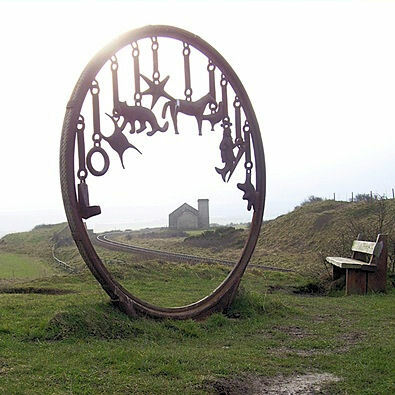 I lined up the perfect picture, through the sculpture, all I needed was that elusive train which finally passed about fifteen minutes after I had moved on to Saltburn. The unfinished, as most were, holiday town of Saltburn by the Sea sits atop the cliff and from my vantage point the scene is dwarfed by the cooling towers, chimneys and smoke of Redcar and Teesside industry. The final information board tells me about Huntcliff Roman Signal Station. Thought to have been built around AD367, it was excavated in 1911 but the site has since been lost to coastal erosion. A great walk, challenging terrain, great sea views, the highest point on the east coast and lots of history, what more could you ask for?